If you are looking for ideas for gardening with companion plants in mind, you have come to the right place! Do you want to know what plants grow good together? 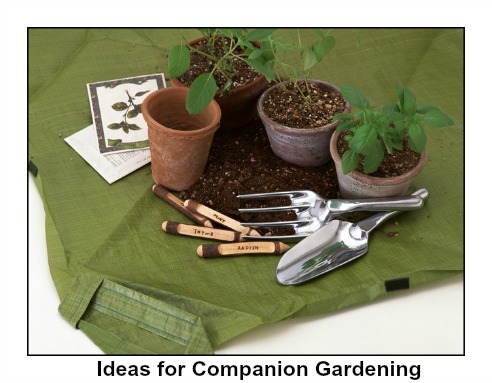 Considering companion gardening is a great way to plan your garden. Including certain plants in your garden, alongside other plants, will help keep garden pests away from nearby plants. This method of repelling pests is preferable to using pesticides or insecticides once pest infestation does occur. 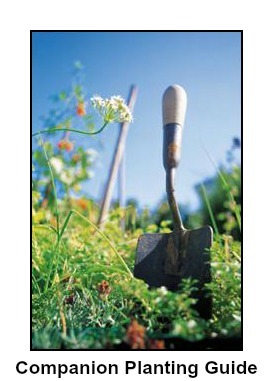 It's an environmentally friendly practice too and it goes hand in hand with organic gardening! In addition to discouraging garden pests, plant companion gardening also claims to improve the growth, health, and food flavour of some plants. Plant Basil with Tomatoes to improve plant growth, flavour, and to repel flies and mosquitoes. Plant Hyssop near Cabbage and Grapes to deter cabbage moths. (do not plant near radishes). Plant Rue near Roses and Raspberries to deter Japanese beetles. Plant Tansy Plant with fruit trees, roses, and raspberries. Deters flying insects, Japanese beetles, striped cucumber beetles, squash bugs, and ants. Plant Tansy Plant near Fruit trees, Roses and Raspberries to deter Japanese beetles, striped cucumber beetles, squash bugs and ants. Plant Garlic with Roses and Raspberries to improve plant growth, and to deter Japanese beetles and aphids. Plant Marigold flowers throughout the garden to discourage Mexican beetles, nematodes and other insect pests. Plant Mint with Cabbage and Tomatoes to improve plant health, and to deter White Cabbage moths. Borage Companion plant for tomatoes, squash and strawberries. Deters tomato worms. Plant Borage with Tomatoes, Squash and Strawberries to repel tomato worms. Plant Nasturtium with Radishes, Cabbage, and Fruit trees as a trap for aphids, and to deter Squash bugs and Striped Pumpkin beetles. Plant Lamb's Quarters with Corn and throughout the garden as a trap for aphids. Plant Thyme with Cabbage to deter cabbage worms. Plant Horseradish with Potatoes to repel potato bugs. Plant Catnip to discourage flea beetles. Plant Rosemary with Cabbage, Carrots and Beans to repel cabbage moths, bean beetles and carrot flies. Making your own organic pesticides is another way to naturally control garden pests. Follow the link below to another page on this website with lots of recipes for homemade pesticides. Below are helpful books with more detailed information about companion planting. These books can be purchased from *Amazon.com online. Click on the images (below) for additional product information and customer reviews. Note - If you have experience with, or suggestions for, plant companions that are not included here, it would be appreciated if you would contact me. I would be happy to pass this information on so others can benefit from your experiences! Thanks!